PHOTO: At an altitude of 9,436 feet, Sani Pass is the highest point in Africa south of Mount Kilimanjaro in Tanzania. Since its first democratic election in 1994, South Africa has been opened to the world, and the world has responded enthusiastically. The striking beauty of the country, its vast diversity of landscape and culture have made it one of the most popular, must-see destinations in the world. Since the 2010 FIFA World Cup in South Africa, recognition and familiarity with the country has grown at an accelerated clip. The pre-tournament coverage of the country was vitally important in bringing the reality of South Africa into the homes of Americans. The World Cup and related television coverage was the first time many Americans experienced any kind of up-close look at South Africa beyond its standard iconic images. For a growing number of people, the familiarity level crossed a threshold at which they became comfortable with the idea of traveling to South Africa themselves. Cape Town, South Africa’s Mother City, where the combining of cultures and ethnicities from around the world began in the 1600s, recently took the number-one spot on The New York Times’ “52 Places to Go” list for 2014. Cape Town’s unique geographic splendor, with giant mountains standing over the oceanside, is enough to draw people from around the world. And when they arrive they can see for themselves what the promises about the cultural richness and the friendliness of the people are about. Those kinds of things can only be hinted at through words, but come across vibrantly through personal experience. South Africa’s safaris are similarly photogenic and are an easy sell. Images of Cape Town and of the Big Five in the wildlands are the two pillars of South Africa’s attraction to first-time visitors. The “Cape-Kruger” package is the standard introductory package, and for good reason. It’s almost inevitable that every first-time traveler to the area will want to experience those two things. From there, there is no end of ways to build a South African experience. After the standard introductory combination of Cape-Kruger, there are a number of second-tier must-sees. Johannesburg is South Africa’s capital city, its largest city, its commercial center and the place where many of the most significant events in the history of Apartheid’s rise and fall took place. There are many specific destinations within the Johannesburg area, including townships such as Soweto and Sophiatown, museums such as the Apartheid Museum. The Cape Wine Country is another area that has become a must-see destination, notable for its natural scenic beauty as well as for the rich wine culture that dates back to the 1600s. The Cape of Good Hope is also high on the list, and the Garden Route and the southern coast, including Hermanus and Port Elizabeth, are also important places to visit. Not so well known, however, is the Drakensberg region in the province of KwaZulu-Natal. The Drakensberg mountains present another side of the many-faceted country. Calling them “The Drakensberg Mountains” is actually redundant because the name “Drakensberge” is Afrikaans for “Dragon Mountains.” It refers to the mountain range that is the eastern part of the Great Escarpment, which surrounds the Southern African Plateau. It stretches more than 600 miles from the Eastern Cape Province in the south and forms the borders between the country of Lesotho and KwaZulu-Natal. It also forms the borders between KwaZulu-Natal the provinces of Mpumalanga and Free State. It’s not just the point itself that is the attraction. 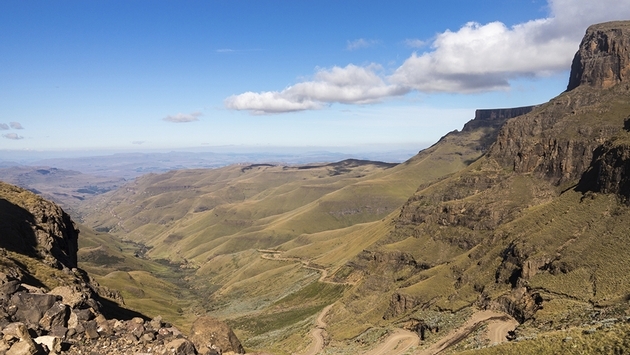 Sani Pass is a destination, but getting to the destination requires traveling through the mountains and a great deal of eye-popping scenery. Within the Drakensberg region is the Kingdom of Lesotho, a separate country within the borders of South Africa. It is a country the size of Belgium with some of the purest diamonds in the world. Mining is a big industry for the country. Much of the population there live very simply in a small village in small homes that might be called huts. Lesotho is very high in altitude, much of it above the timber line where only small brush grows. The tour operator Kingdom of the Sky (www.beachbushberg.com) will take guests to to Lesotho and set up personal meetings with the local people. The Mandela Capture Site is the place where Nelson Mandela was taken prisoner by police and charged with crimes that would end up leading to a 27-year period of imprisonment. The site has a small museum and a sculpture where he was picked up. You have to observe the sculpture from a precisely determined spot to see the image of Mandela’s face. Until you find the right spot, the sculpture looks like a bunch of vertical pieces of iron standing together. The Drakensberg Boys Choir School is located in the mountains of KwaZulu-Natal and it has a world famous vocal group that performs every Wednesday, playing a range of music from 17th century liturgical music to 20th- and 21st-century popular music, Zulu music and even a John Cage-style sound painting. The Midlands Meander is an area that became known for a community of artists and craftspeople who gathered there. One of the more notable establishments now in the area is the Ardmore design studio, where craftspeople create ceramic sculpture of great detail and color. The studio cannot produce enough to keep up with demand. The region is popular for hiking, birding, horseback riding, hot air ballooning, helicopter rides, falconing, quad bike riding and other outdoor activities. It also has many resorts, hotels and restaurants to choose from. Though Drakensberg is a mountainous region, it is not far from the game reserves in Mpumalanga and Limpopo provinces, so a visit to Drakensberg is easy to coordinate with a safari. And it’s only a couple of hours’ drive from Durban, the oceanside capital of KwaZulu-Natal province, a city with beaches warmed by Indian Ocean currents moving southward along Africa’s Indian Ocean coastline. It’s a good airline hub and a great city to begin or end your journey to Drakensberg. 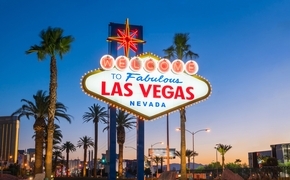 A version of this article appears in print in the August 2014 issue of Vacation Agent Magazine.